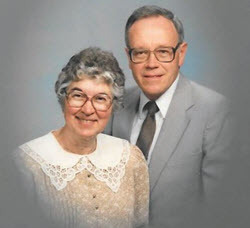 After graduating from Wisconsin Lutheran Seminary in 1955, Martin’s call was to be the assistant pastor at St. John’s Evangelical Lutheran Church in St. Paul, Minnesota. Pastor O. J. Naumann was the head pastor and also served as synod president. Shortly after Martin assumed his ministry at St. John’s, Pastor Naumann left for Germany. There were three funerals in ten days while he was gone. Both of us remember Pastor Naumann as Professor Naumann because he taught in the high school department of DMLC for a few years. He was also a neighbor to the Janke family during those years. Martin especially remembers their dog, Muggins, who came over to their house for treats and got them! Three years later we and our two children, Paul and Lynne, moved to Roscoe, South Dakota, where Martin served at St. Paul’s Evangelical Lutheran Church. Services were in German and English every Sunday. Sermons for funerals were often preached in German and then in English. Hymns were posted for both languages, and people sang in the language they preferred. We had no Christian day school in Roscoe, but we had a flourishing Sunday school. We were able to start a Children’s Choir that sang often for services (even for German services) and caroled at nursing homes and for shut-ins at Christmastime. They learned a few German songs: Gott ist die Liebe, Stille Nacht, and O du Froeliche. After caroling we were very cold, but some of the mothers warmed us up with hot cocoa and cookies. Our children even sang for funerals! We had a good working relationship with the public schools. The principal would release the children shortly before the funeral began. They would walk the few blocks to the church, sing their hymn (usually hymn 597 in TLH), and then quietly leave church and walk back to school. We also started our first Sunday school class for special needs students. There were only a few students in that class. We had vacation Bible school for three weeks in summer. It was a wonderful teaching tool for children without a Christian day school. A rotation of four courses taken from Luther’s Small Catechism with memory work was what we used: The Ten Commandments, The Creed, The Lord’s Prayer, and The Sacraments, published by Northwestern Publishing House. At the end of the three weeks there was a closing service with hymns and recitations by the children. Confirmation instructions were held on Saturday mornings for grades five through eight. Marie taught Bible history to the fifth and sixth graders, and Martin held confirmation instructions for grades seven and eight. From Roscoe we moved to Fond du Lac, Wisconsin, with two more children, James and Karen. Our church was Faith Evangelical Lutheran. We lived right across the street from Winnebago Lutheran Academy, and our children upon graduating from Faith Lutheran School attended and graduated from WLA. The shortage of teachers was still there, the church’s finances were unstable, the enrollment was growing, the first through third grade classroom would be overcrowded, and the teacher was new, so Marie volunteered to teach Kindergarten. There were two boys and six girls in that first class. Four of the girls went on to DMLC to become teachers and are still teaching today: Sheila (Jones) Krause teaches at Kettle Moraine LHS in Jackson, Wisconsin; Lori (Rischette) Gieschen teaches at Christ in Eagle River, Wisconsin; Karla (Thiesfeldt) Matter teaches at Bethlehem in Germantown, Wisconsin; and Karen (Janke) Hunter teaches piano at Westside Christian School in Middleton and at Our Redeemer in Madison, Wisconsin. To God be the glory! In 1965 we also started a special needs class at Faith. We asked Redeemer and St. Peter’s in Fond du Lac if they had any people with special needs who would be interested in such a class. Together we had about eight students. We met for classes after school on Thursday so each student could attend church at his or her home church. Our synod’s Kindergarten Sunday school materials selected stories and the large Concordia picture flip charts were our materials for teaching. Oh, how easy it was to review stories with those beautiful, detailed pictures. Marie was asked to write an article for the Lutheran Educator about the class. It appeared in the magazine but under the name Mary Janke instead of Marie Janke. My only claim to fame! After nearly 15 years at Faith, Martin accepted the call to David’s Star Lutheran Church in rural Jackson, Wisconsin. He was installed there on a very icy-cold Sunday in January 1980. David’s Star is one of the oldest Lutheran churches in Wisconsin, but it is not the oldest in the WELS. From 1845 it was a member of the Buffalo Synod. That ended in 1862, and so David’s Star was without a synod until 1892 when it became WELS. The founders of the church came from Germany in 1843, bringing with them a pastor and a teacher. Classes for the children were held on the boat. The first building was a school. The present church was built in 1856 and is still used today. David’s Star has 80 acres of land! Most settlers claimed 80 acres, and 80 acres was also claimed for a church and school. Some of the 80 acres is wooded with a natural amphitheater where services for graduation and mission festival are held (weather permitting). Marie never seemed to get out of Kindergarten, except for finishing the 1979-1980 school year at Trinity-Pleasant Valley Road in West Bend, Wisconsin, for a seminary wife who had a baby in March. The first through fourth grade classroom had only seven or eight students, but they were gifted and a pleasure to teach. The next school year she was back in the David’s Star Kindergarten classroom until 1996 when she retired. Before David’s Star had a Sunday school, we started what we called Bible Story Time for 4-Year-Olds. It was a joy to teach God’s Word to those little ones. Each student had a colorful folder to hold the weekly Bible story sheets. We saved copies for them if they missed a class. They were so proud of their folders, and we reviewed the stories often. After a silent heart attack in 1992 and a stroke in 1995, Martin became the visitation pastor of David’s Star. He continued that call until the end of 2014. MLC has been a part of our lives, our children’s lives, and our grandchildren’s lives. Martin attended the high school department at DMLC. From there he went to Northwestern College in Watertown, Wisconsin, for four years and then on to Wisconsin Lutheran Seminary in Thiensville, Wisconsin. His vicar year was at St. Peter’s Evangelical Lutheran Church in Fond du Lac, Wisconsin. 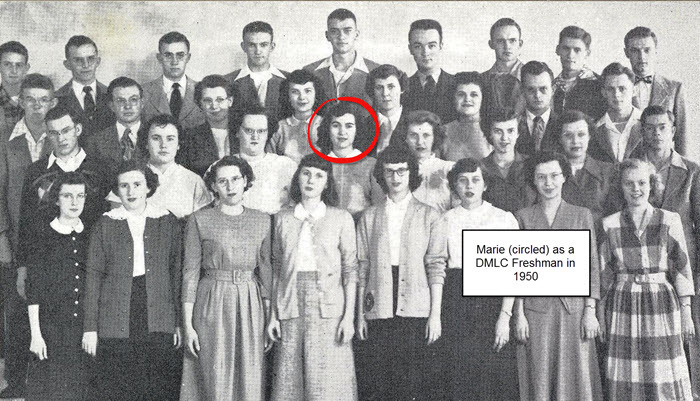 Marie also attended the high school department of DMLC. Both Martin and Marie had Martin’s father, Professor Richard Janke, as one of their teachers. Professor Janke taught at DMLC from 1924 until 1955, when he died on February 10. Marie attended DMLC for one year and some summer courses. She did not graduate with her class of 1952, but because of the severe shortage of teachers at that time, many students chose to go out as emergency teachers. Marie was one of those. She taught at St. Paul’s Evangelical Lutheran School in rural Ixonia, Wisconsin, for five years. Our daughter, Karen, graduated from DMLC in 1983 and was a tutor at Martin Luther Preparatory School in Prairie du Chien, Wisconsin. Our two sons, Paul and James, attended Northwestern College at Watertown, Wisconsin, and then went on to Wisconsin Lutheran Seminary in Thiensville, Wisconsin, and are serving in WELS congregations. As of 2014, four of our granddaughters—Jennifer, Jessica, Sarah, and Hannah—graduated from MLC as teachers. Two were tutors at Luther Prep at Watertown, Wisconsin. Four of our grandsons graduated from MLC and have gone on to Wisconsin Lutheran Seminary. Joshua graduated and is serving in a WELS congregation, Philip is a senior at the seminary, Peter is in his vicar year, and Eric is a first-year student. We still have one grandson, Jackson, who is attending MLC and is a senior. We do have children and grandchildren who have chosen not to pursue the preaching or teaching ministry, and that is also a blessing. We need dedicated lay people to support our churches and schools and to do the work we have chosen not to do.